Ladies Fancy Shawl Dancing (the newest form of women’s dance) is often called Northern Shawl, as it does come form the Northern tribes along the US-Canadian border. This dance style is similar in dancing and the bright colors to the Men’s Fancy Dance. The ladies wear their shawls over their shoulders, and dance by jumping and spinning with the music. Though the fancy shawl involves more motion and agility than other styles of dance, the grace of the woman is always expressed. As the name of the dance-style would imply, particular emphasis is paid to the shawls, with elaborate designs, appliqué, ribbon work, and painting. Long fringe hangs from the edges of the shawl, and flies round the dancer as she moves to the music. Women’s Traditional is the oldest type of women’s dance. It is sometimes referred to as Straight or Buckskin Dancing, and like Men’s Traditional there are many tribal variations, including wearing a buckskin, cloth or wool dress. 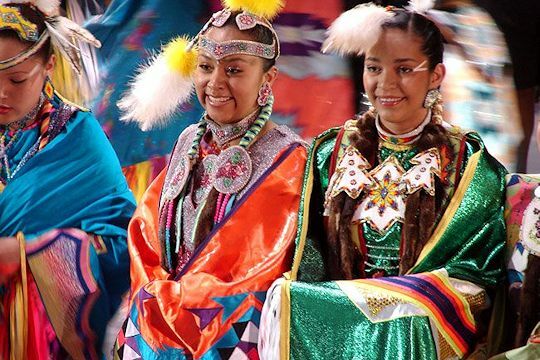 Regardless of the tribal variations, there are two important items used by Traditional Dancers. One, is the fan. This fan is usually beaded and is raised to the drum, in honor, during the “honor” beats of the songs. The second item, is the shawl. This colorful, fringed shawl is carried over one arm. The fringe of the shawl sways with the movement of the dancer. Other Uses: Shawls are a very popular give-away item. Also, whenever a woman enters the dance arena without her dance outfit or regalia, she will most likely stop long enough to wrap a shawl around her shoulders. Regardless of the type shawl you wish to make, we have tried to assemble all the available online links and resources to help with the task. As additional information is found or created, we will add it in order to keep this reference current (if you haven’t noticed, several more links have been added to the Moccasin page since it was created). In addition to the Web resources, we also highlight related products offered by Crazy Crow to make your dance shawl craft project easier and the results more assured. I must admit that it was much more difficult than I thought it would be to find information regarding making shawls on the web. It almost made me turn in my web connection -and I definitely have less hair (that’s happening anyway). If anyone knows of articles ON THE WEB that provide the ‘how-to’ diagrams online, please forward it to Craft Focus. Besides commercial sources which are listed, the best information I could get was in discussion forums at Powwows.com. This looks like a great place to ask questions and get help from craftworkers from all parts of the country. Try it out! Many shawls are decorated with ribbonwork applique. Part one of this 2-part article will help you use this beautiful means of adornment: What is Ribbonwork, Terms used in Ribbonwork, What kind of ribbons are used today, Making Ribbons using material, What fabric to use and The important aspects of ribbonwork. In Part Two, the different styles of ribbonwork are discussed, providing examples of how to prepare your ribbons for the technique. Shows some templates you can use. Features three appliqué ribbonwork techniques: Plains ribbonwork, Osage ribbonwork and Woodlands ribbonwork. The Plains and Osage Style Ribbonwork are mostly the same style only the how the ribbon is put on the material is different.